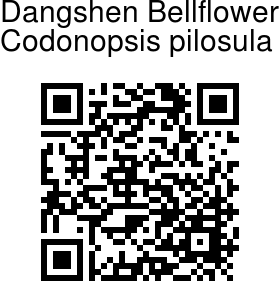 Dangshen Bellflower is a twining perennial herb reaching the length of 5-10 ft with roots 1-3 cm thick. The plant is shrubby and dense. 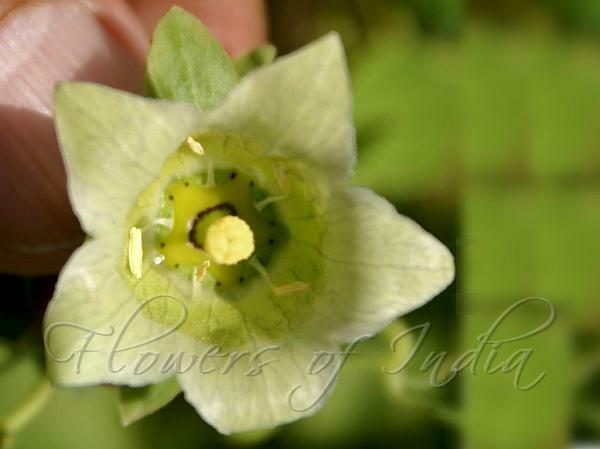 It produces	light green five pointed bell shaped flowers with prominent yellow or light purple veins. Flowers are yellow-green, with purple spots inside, broadly bell-shaped, 1.8-2.3 x 1.8-2.5 cm, shallowly lobed. Lobes are triangular, tip pointed. Filaments are slightly dilated at base, about 5 mm; anthers elongate, 5-6 mm. Stigma is white bristly. Sepal cup is adnate to ovary up to middle. Sepals are broadly lanceshaped or narrowly oblong, 1.0-2.3 cm x 6-8 mm, margin subentire or sinuate, apex obtuse or acute; sinus between calyx lobes narrow and pointed. Roots are carrot-shaped or fusiform-cylindrical, 15-30 x 1-3 cm, often branched. Leaves on main stems and branches are alternate, those on branchlets opposite. Leaf-stalks are 0.5-2.5 cm long, sparsely bristly-hairy. Leaves are gray-green below, green above, ovate or narrowly ovate, 1-7.3 x 0.8-5 cm. Leaf underside is sparsely or densely hairy, rarely hairless, base is somewhat heart-shaped, rounded, or flat, margin toothed, tip blunt or pointed. Photographed in Herbal Garden below Cheshmashahi, Srinagar, Kashmir.